B&P Littleford Pusher Centrifuges are known for relentless productivity in separation of coarse solids from free-draining crystalline slurries. The products flow in a gentle, single-stage, handling and washing as they are transported through the basket. The B&P Littleford Pusher Centrifuge is used in a myriad of applications all over the world from traditional separation processes to specialized operations: salt from dilute caustic in chlor-alkali plants, military-grade nitrocellulose separation, dilute acid cottonseed delinting, soda ash processing, potash processing, heavy metals recovery and Paraxylene processing. The strengths of the B&P Littleford Pusher are most evident for special separation process requirements: long retention times, low solids loss in the filtrate, low crystal breakage, intensive solids washing, a drier cake and minimum wear. 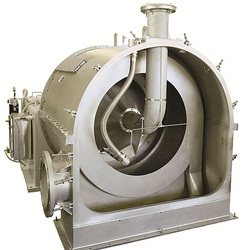 These features make it an outstanding machine for most crystalline products. Our specialists design and construct the Pusher for standard products, but can also customize it in cooperation with customers for special or difficult solid separation applications to optimize efficiency and meet individual requirements. B&P Littleford Pusher centrifuges have amassed an impressive track record for reliability under all kinds of separation service conditions. This dependability is founded in our sound design concepts, precise engineering and top-grade materials. A single-piece reversible wedge-slot screen separates solids and liquids efficiently. The screen is supported by a centrifugally cast, milled-slot cage basket. The main hollow shaft, which drives the basket, is carried by widely spaced, heavy-duty bearings. The hydraulic pump is belt-driven by the main drive motor for energy efficiency, safety and reliability. The pusher shaft is driven forward and backward by the internal, self-contained hydraulic piston. This assembly requires no external controls. The rugged base of the separation pusher houses the hydraulic reservoir and provides a rigid support for the entire rotating assembly. Cooling coils inside the reservoir maintain the hydraulic system temperature to optimum levels. B&P Pushers are used in a myriad of separation applications such as bulk chemicals, plastics production, mining and minerals, fiber industry, and food processing. B&P Littleford has resources to help you trial your separation process on a pusher centrifuge either at our Saginaw, MI Tech Center or by renting one of our S-200s to try at your own facility. We are here to help with your separation needs. Contact us to learn how we can help you identify and optimize your process.